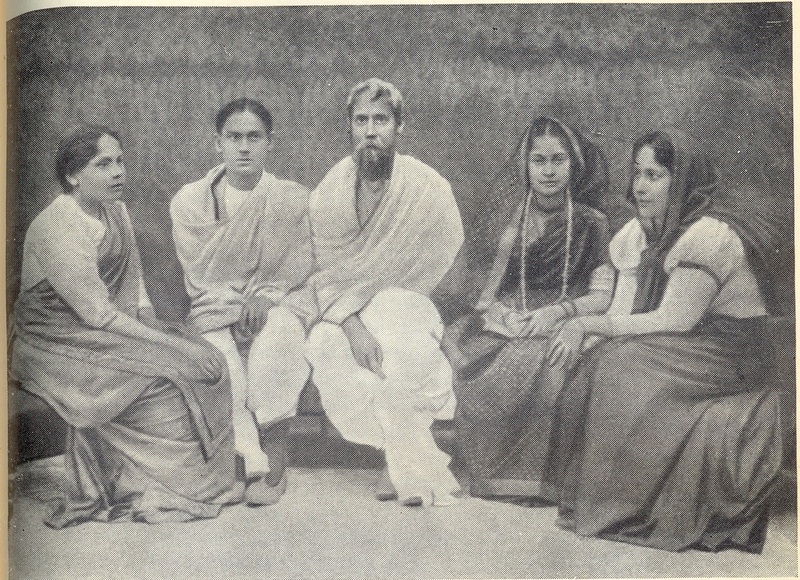 Pictures of Rabindranath Tagore, his family and matters related to his life will be added to this page gradually. These pictures are offered for the reader’s enjoyment. It is hoped that more people in the West will become familiar with the work of this writer, artist, philosopher. 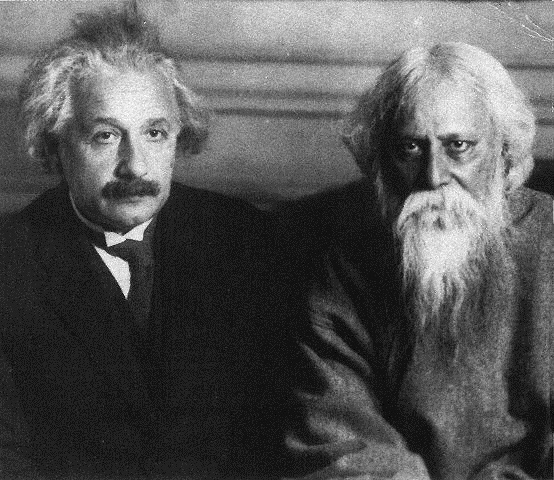 Here Tagore is pictured with the astronomer Karel Hujer. Hujer was a Czech who settled in the US after fleeing from the Nazis in the 1930s. An avowed pacifist, Hujer was an admirer of Gandhi and Tagore. 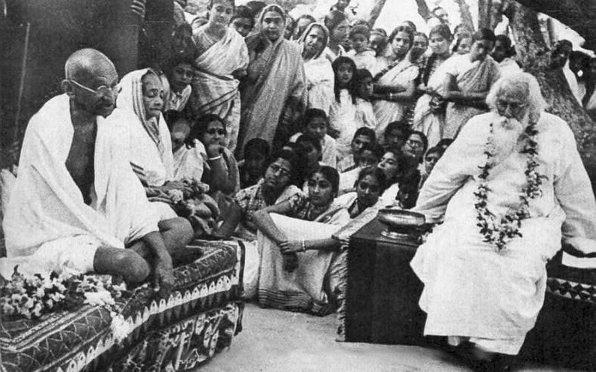 In 1949, after both Gandhi and Tagore were deceased, he organized the World Pacifist Meetings in India. The photo was taken in 1935, by an unknown author; it is in the public domain. 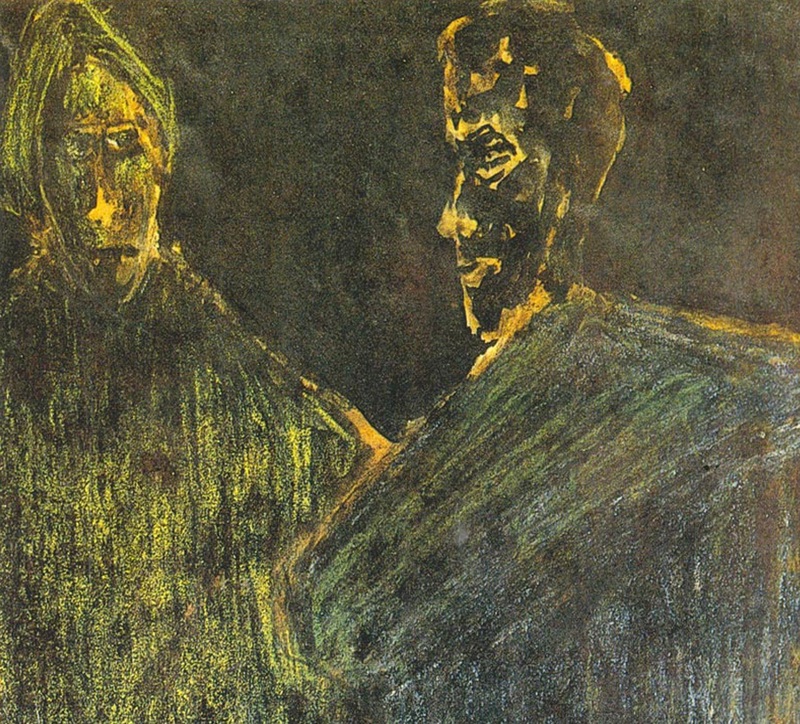 Tagore’s painting, entitled Man and Woman. Tagore started painting after the age of 60. 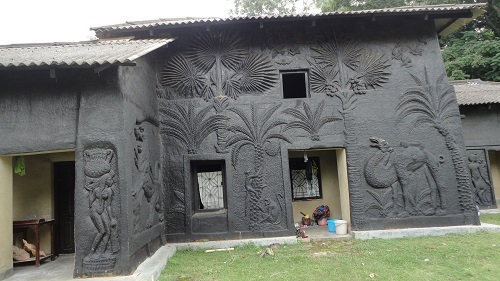 His brief career as a painter is discussed in the book, Rabindranath Tagore. Tagore once said of his career as a painter that he was “secretly drawn” to work that came to him “least easily”. Perhaps one of his challenges was the fact that he did not see colors the way most people do. Tagore had difficulty distinguishing reds from greens. Some observers theorize that this color confusion may have explained some of the artist’s dramatic color schemes. However, with a man as complex as Rabindranath Tagore, this explanation likely oversimplifies the creative process. This picture is labeled “Untitled” and is described as being a portrait of a dancing girl. The date of the painting is unknown; it was uploaded from Wikimedia Commons and is in the public domain. Rabindranath Tagore was a philosopher, artist, poet, playwright, musician and social reformer. In 1913, he became the first non-European to be awarded the Nobel Prize in Literature. Despite this distinction, Tagore never earned a formal academic degree. 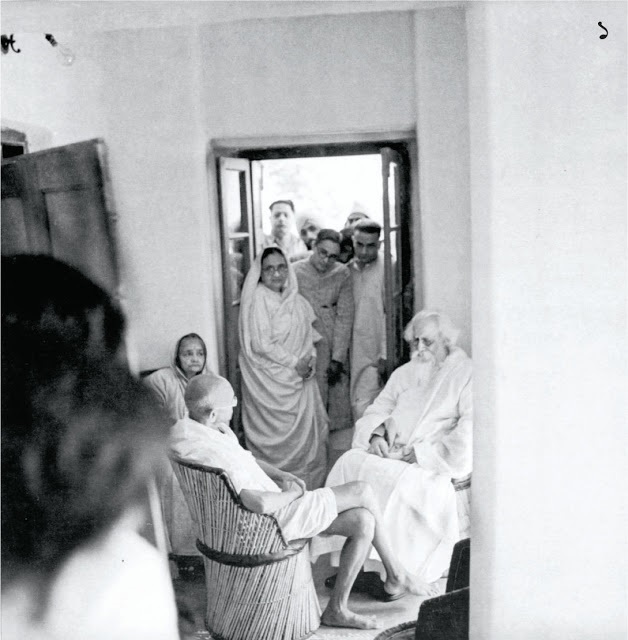 When referring to his own education, Tagore spoke about ‘freedom’, not ‘discipline’. He described his childhood home, which inspired his point of view, as one in which “freedom in the power of our language, freedom of imagination in our literature.. ” prevailed. Rote learning and routinized instruction were stifling and counterproductive, in his view. Tagore believed that education was an organic process in which the individual responded to the environment. Much in his philosophy of education resembled that of another Nobel Laureate, Marie Curie. Both Nobel Prize winners placed strong emphasis on nature. Both insisted on the importance of physical exercise. And both believed that exposure to brilliant minds and brilliant work would elevate, not frustrate, a child. Both were certain that bombarding a child with structured lessons was more likely to kill an appetite for learning than to stimulate it. They believed that acquiring knowledge should be as effortless as acquiring language is for a toddler. While Rabindranath Tagore and Marie Curie believed that children should live in a harmonious relationship with nature, Tagore carried the theme of harmony further. He believed it was a function of education to foster harmony between people. He wanted children to be taught arts, especially music, because he thought that would enable them to develop sympathy for others. He thought that education should emphasize the progress of nations and not focus on wars and territorial conquests. Rabindranath Tagore did not simply aspire to educational ideals: he gave them life. In 1901 he founded a school, Patha Bhavana, which embodied his principles. After he won the Nobel Prize, he invested in his school and expanded it into a university. That campus is now the site of one of the most prestigious universities in India, Visva-Bharati. Were Rabindranath Tagore’s ideas about education misguided? Many people who work in education today apparently believe so. Increased emphasis on standardized learning and objective testing seems to be proof of that. Schools today are laboratories in which competing theories of education are tested. As the experiment with today’s children proceeds, so will the dialogue about their future continue.